Create delectable desserts easily with this mix that combines the richness of cream and sweetness of vanilla. All Food Additives Are of Plant Origin and Synthetic Origin. May contain traces of cereals containing gluten, egg, soy and milk. 1. Bring milk to boil. 2. 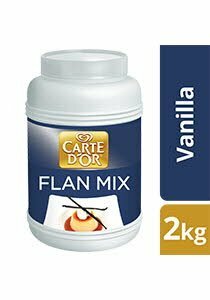 Slowly dissolve Carte d’Or Vanilla Flavoured Flan Mix in the milk while stirring continuously. Turn off heat. 3. Pour into moulds and allow to cool in the refrigerator. Quick and simple to prepare, it's perfect for busy kitchens. High yield mix - excellent for cost and portion control. Cost effective - high profit potential, quick to prepare versus scratch-made desserts. Close tightly and store in a cool and dry place.